After Beyonce’s lights out headlining performance at the Mercedes-Benz Superdome Super Bowl halftime show, Destiny’s brightest child kicks off her US tour beginning in June on the west coast at the Staple Center and will be working her way across the country to finish her tour in Brooklyn, at Jay Z’s Barclays Center. 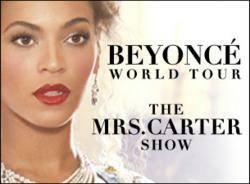 With over 20 stops in between, both longtime and new fans alike will not want to miss The Mrs. Carter Show 20123 world tour as you can sure that it will be a hot! Order your Beyonce tickets online today.